Because of their many novel and advanced applications, there is increasing interest in layer silicates from the scientific and technical communities. Appropriate application of these minerals requires deep understanding of their properties and of the processes where they are involved. This chapter, by providing fundamental definitions and crystal structural and chemical data pertaining to layer silicates, aims to introduce this field to new researchers and technicians, by describing the fundamental features leading to different behaviours of layer silicates in different natural or technical processes. The subject addressed is vast and so the reader is referred in some cases to work already published. The focus here is on layer silicates for which detailed crystal structures are given in the literature and which are likely to be used in an applied way in the future. Layer- silicate minerals fulfilling these requirements are: (1) kaolin-serpentine group (e.g. kao- linite, dickite, nacrite, halloysite, hisingerite, odinite, lizardite, berthierine, amesite, cronstedtite, nepouite, kellyite, fraipontite, brindleyite, guidottiite, bementite, greena- lite, caryopilite; minerals of the pyrosmalite series); (2) talc and pyrophyllite groups (e.g. pyrophyllite, ferripyrophyllite, willemseite); (3) mica group (i.e. 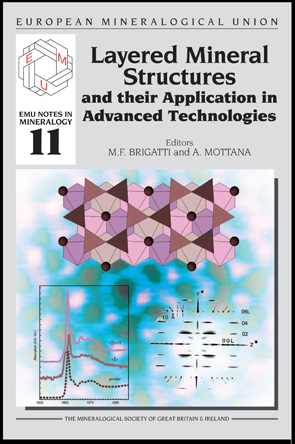 some recent advances in crystal chemistry and structure of dioctahedral and trioctahedral micas); (4) smectite group (e.g. montmorillonite, saponite, hectorite, sauconite, stevensite, swi- nefordite); (5) vermiculite group; (6) chlorite group (e.g. trioctahedral chlorite such as clinochlore, di,trioctahedral and dioctahedral chlorites such as cookeite and sudoite); and (7) some 2:1 layer silicates involving a discontinuous octahedral sheet and a modu- lated tetrahedral sheet such as kalifersite, palygorskite and sepiolite; (8) imogolite and allophane. vi-xiv + 375 pages. ISBN 978-0-903056-27-4.